﻿The band provides the awesome sound to the show, but the visual ensemble tells the story through choreography. The color guard (flags) and dancers provide the audience visual effects complimentary to the music. 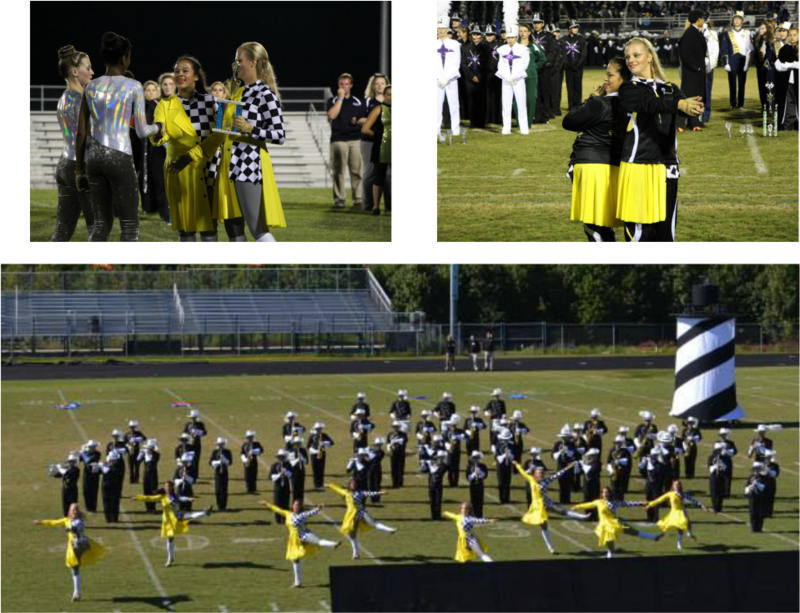 Visual ensemble is very much a part of the marching band and parents of the VE are also part of the band boosters. VE Parents are encouraged to attend booster meetings. While the flags and show outfits are provided for all of the VE team, members will be fitted for a special show outfit each year. Each member will also need to purchase a warm up suit and guard shoes through the band boosters. The warm suit is embroidered with their name. This warm up suit and shoes are an additional expense to the marching band fees. It is typical of rising 9th graders to not have any color guard experience at all. The team is taught the techniques and with practice they will be able to perform on the field like pros! The Visual Ensemble does require try-outs, usually in the spring (April or May). Check our calendar for this year's audition dates and come join the VE Team!